A quick Google search for “core” defines the word as “the central or most important part of something.” Hopefully, this article will help you strengthen the central/most important part of your body so you can transcend deeper into your core mental and core spiritual practice. The core is often attributed to just the abdominal muscles aka having a flashy six-pack. However, there are roughly 30 muscles that work synergistically to stabilize your torso and are considered part of your core. Some of the muscles involved are the internal oblique, external oblique, rectus abdominis, transversus abdominis, psoas major/iliacus, erector spinae, diaphragm, latissimus dorsi, longissimus thoracis, gluteus maximus, trapezius, and pelvic floor. As the muscles contract, they stabilize the spine, pelvis, and shoulder girdle. Stabilizes and reduces strain on the spine and pelvis which reduces back pain. Improves posture and balance which helps prevent injuries. Enables the rest of the body to generate increased force, power, and speed. Fosters even body weight distribution which protects the back. Improves quality of life and ease of daily living. Maintaining a neutral pelvis position (specifically, the ASIS or Anterior Superior Iliac Spine and the pubic bone are in line with each other in the frontal/coronal plane) and a neutral spine optimizes the body’s ability to activate the right muscles during movement. This way, you use the least amount of energy to maintain a desired position, to cushion and protect the spine, and to breathe. Additionally, it minimizes the stress on the body’s tissues. You can also improve overall core stability by utilizing anti-rotation, anti-extension, and anti-flexion exercises around a neutral spine and pelvis. Another element in building overall core strength is your breathing. The diaphragm is a core muscle, so practicing purposeful breathing during more intense “core strengtheners” gives you the most bang for your buck when building overall core strength. Inversions energize us and ignite the inner fire by naturally utilizing gravity to weigh our abdominal organs on the diaphragm. For beginners, Bridge Pose (Setu Bandhasana) and Two-Legged Table (Dwi Pada Pitham) are ideal inversions. With continued practice, Crow Pose (Bakasana), Headstand Pose (Sirsasana), Handstand/Downward-Facing Tree Pose (Adho Mukha Vrksasana), Peacock Pose (Mayurasana), and Scorpion Pose (Vrschikasana) are all great core strengtheners. 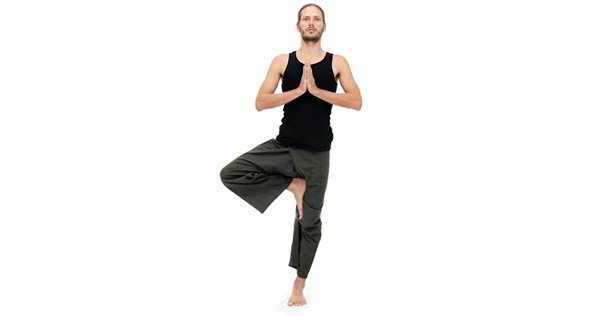 Chair (Utkatasana), Extended Hand-Toe Pose (Utthita Hasta Padangusthasana), Tree Pose (Vrksasana), Lord of the Dance Pose (Natarajasana), Warrior I, II, III (Virabhadrasana I, II, III), and Extended Triangle Pose (Utthita Trikonasana). Some of the most creative core strengthening flows stem from the earth bound asanas that utilize the core. Some great places to start include Boat Pose (Navasana) or Staff Pose (Dandasana). Kapalabhati Pranayama - an invigorating breath that builds heat in the body by sharply exhaling while pulling the navel toward the spine. Known for the active and quick exhalation, with a passive inhalation. One round is roughly 30 exhalations with a minute of natural deep breaths for rest. Ujjayi Pranayama - known as victorious breath, this ocean/Darth Vader-like sound fosters full expansion of the lungs and can be integrated into asana practice. Starting in Tadasana, allow your shoulders to slowly lift toward the ears then exhale sending energy through your fingertips to the ground. Inhale sweep the arms toward the air and exhale swan dive or hands-to-heart forward fold. Inhale halfway lift and exhale release the spine. Step back with the right leg and extend the left arm up toward the ceiling, lifting with the right side of the body and potentially lifting the right wrist off the mat, allowing the right fingertips to graze the ground. Hold for 5 breaths. Release the right hand toward the ground, left index and middle finger wrap around the big toe on the left side. For beginners, keep the foot on the ground and find a twist in the spine for 4-5 breaths, then place both hands underneath the shoulders and step the left foot back to stack on top of the right foot and hold, eventually lift the left hand to the sky and hold for another 4-5 breaths, return to plank when you are done. For advanced yogis, use the left arm to lift the left foot off the ground and work toward lifting the left foot toward the ceiling and eventually having the sole of the right foot planted on the ground, hold for 5-10 breaths, return to plank when you are done. Eyes of your elbows (where they bend, aka wink!) facing towards each other, knit the ribs together, send energy from the top of the head through the heels, always feel free to modify with the knees on the mat and/or lower to the forearms. Hold for five breaths, then go into vinyasa flow when you finish and meet in Adho Mukha Svanasana/Downward-Facing Dog. From Adho Mukha Svanasana inhale forward to Utthita Chaturanga Dandasana, exhale slowly to Chaturanga Dandasana. Be mindful to keep the forearms perpendicular to the earth, shoulders in line with the elbows, and elbows superglued to the body.For beginners, hold for 5-6 breaths. Exhale lower and complete a vinyasa flow to meet in Adho Mukha Svanasana. For advanced yogis, hold for 2 breaths, then lift one leg for 2 breaths, then lift the other leg for 2 breaths. Exhale lower and complete a vinyasa flow to meet in Adho Mukha Svanasana. Hop or step your feet to meet your hands at the top of the mat. Inhale halfway lift, exhale forward fold, and inhale reverse swan dive up. Hands at the heart, send weight into the left leg and lift the right leg into tree. Hold for 5 breaths, challenge your balance by closing your eyes. Lower your leg back to the mat. Inhale both arms toward the sky and exhale sink the hips back and keep the knees over the ankles for Utkatasana. Hold for 5 breaths, exhale lower the hands to the mat. Inhale halfway lift, exhale forward fold, and inhale reverse swan dive up. Repeat in Tadasana: Now switch all italic lefts to rights and rights to lefts, you got this! Have fun playing and building a stronger core with this asana flow! Share below any of your fun core flows or asanas.